A close up shot of Clay Squared tiles shows the variety of colors available to midcentury designers. Photo courtesy of Clay Squared. By the 1950s, color entered the post-war scene of prefabrication. Perhaps it was the spirit of optimism or maybe a backlash from the frugality and restraint of the war years. In any case, colorful pastels — pinks, mint greens, lilacs — became ubiquitous in American architecture. “The pastel pink was a statement and it was a love it or loathe it concept,” says Josh Blanc, designer at Clay Squared, a manufacturer of historic tiles. 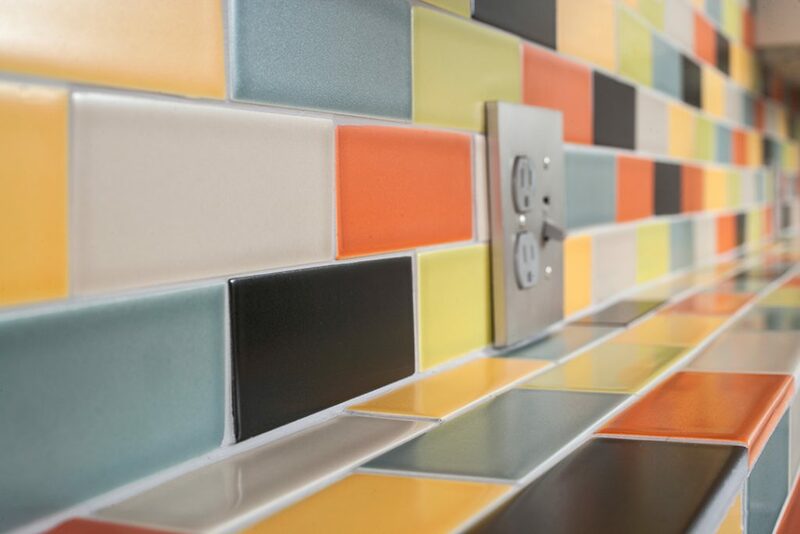 Color remained a defining characteristic of interior design until the late 1970s, when more muted tones became popular and eventually whites and neutrals returned as the default color for tile in bathrooms and kitchens. However, today more than ever people are preserving their pink-tiled bathrooms that were once ridiculed as flamboyantly outdated. Pam Kueber on her website Save the Pink Bathrooms estimates that between the 1940s-’60s more than 5 million pink bathrooms went into American homes, and many are still in existence. 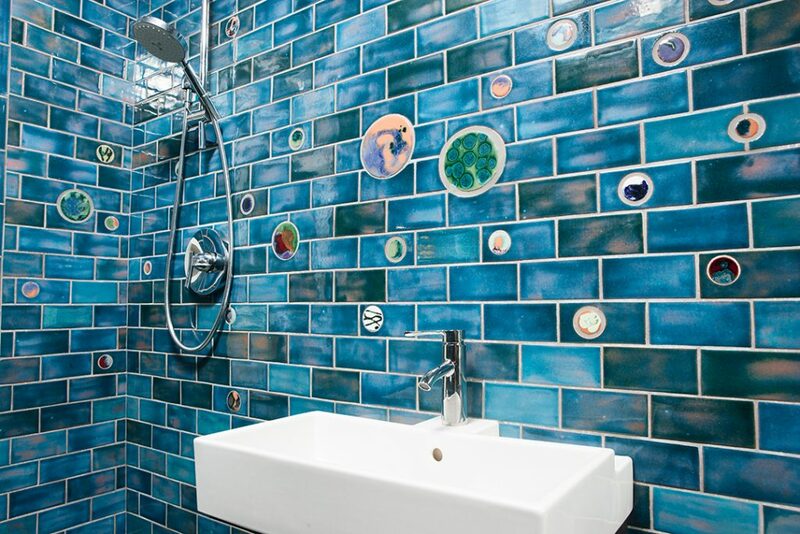 To patch areas of damaged tile, Josh recommends getting creative and saving some money by adding tiles of a different color, such as a mosaic. Photo courtesy of Clay Squared. If you’ve inherited original, colorful midcentury tile — perhaps even a pink bathroom — and feel like reaching for the sledge hammer, Blanc recommends giving it some time. Or perhaps you’ve inherited original midcentury tile that’s in less than ideal condition. In such a case, Blanc has several suggestions for repairs and restorations that won’t break the bank. First, assess the grout. Dirty and deteriorating grout can make tile look bad, and it’s a repair that costs only a few hundred dollars. Then, if you see cracked and damaged tiles, it’s important to determine the extent of the damage. Before replacing a tile, find out what caused the crack in the first place. Tiles are often indicators of larger structural problems, such as a shifting foundation in older homes. Unless the foundation problem is repaired, new tiles will become cracked in their place. Also, keep in mind that cracked tile cannot be repaired but must be replaced. Porcelain tiles are essentially glass, so when cleaning, it’s important to use soft brushes and gentle cleaners to prevent scratching. Photo courtesy of Clay Squared. If only a few tiles are damaged, Blanc recommends first searching eBay for a set of matching tiles. Or, getting creative. 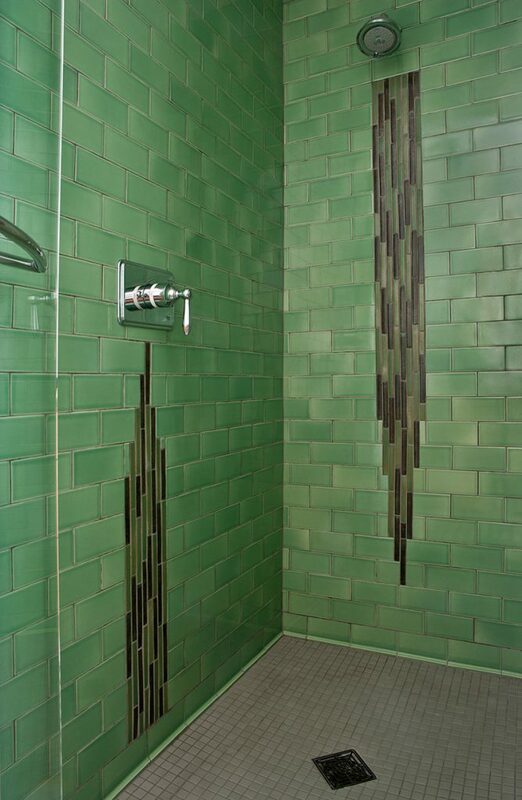 Mint green was a popular color for midcentury bathroom tile. 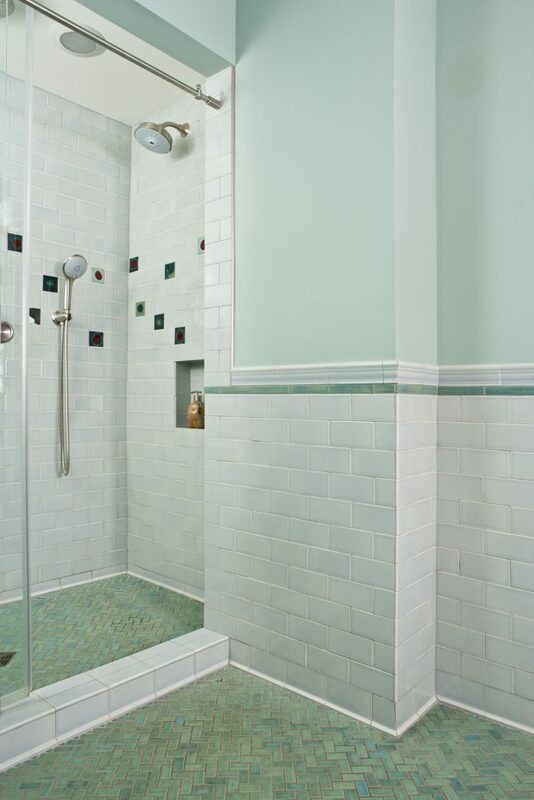 This shower includes colorful accent tiles that are visually interesting and redolent of the period. Photo courtesy of Clay Squared. In cases where the damage is extensive, replacing the tiles is your only option to maintain the midcentury aesthetic even though it will be costly. For the most authentic look, Blanc recommends sourcing tiles from manufacturers, such as Clay Squared, that maintain high standards of authenticity and durability. The original tiles are designed to last a lifetime if cared for properly. But many people can make the mistake of scrubbing their tile with cleaning implements that are too abrasive. “What I tell a lot of people that any ceramic glaze tile is basically glass you would never wash your windows with something abrasive,” Blanc says. Abrasive tools can scratch the surface of tiles, which allows dirt to seep in. When this happens, they can become impossible to clean. He also recommends using a gentle cleanser of dish soap, vinegar and Borax to preserve the tiles’ original glaze. Check out these tips and a recipe from the Handmade Tile Association for a safe and affordable tile cleanser.